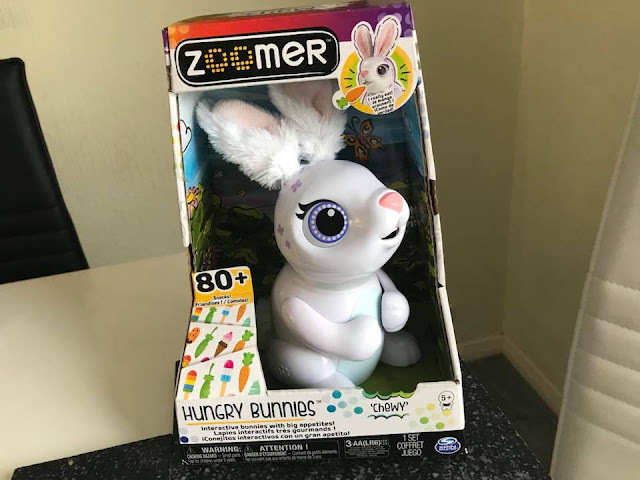 Earlier in the year I had the chance to review Zoomer Zupps Pretty Ponies but as is the world of Zoomer, it's expanding again and they'e back with their latest interactive toy, Hungry Bunnies. Interactive Bunnies with Big Appetites! So what exactly are Zoomer Hungry Bunnies? These fluffy eared bunnies are the latest pet for your little ones to adopt and they are always ready and waiting for food. When you open the box you will find a bunny, we received the one called Chewy. Also included is: 4 snack sheets, basket, treat tracer and instruction manual. 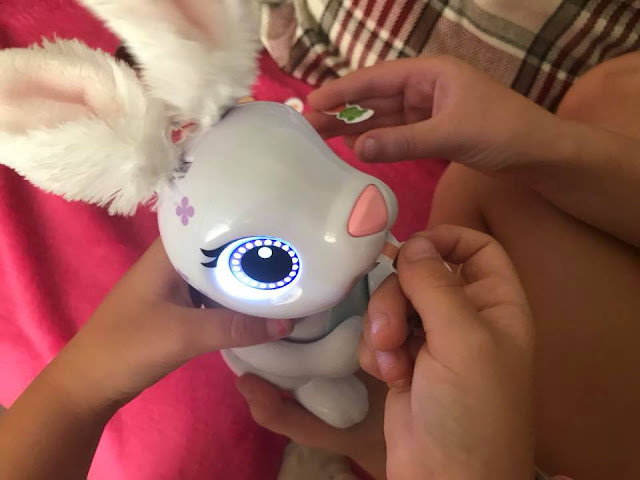 Being interactive, you can essentially feed your bunny treats which they can then magically poop out, they enjoy a really good belly tickle and of course they adore playing fun games like the all singing all dancing music game. This toy does require 3 x AA batteries which aren't included so be warned if you plan on buying this as a Christmas present, make sure you've bought the batteries beforehand! As I mentioned your bunny comes complete with 4 snack sheets. This includes over 80 different snacks, and just like us the bunny needs a balanced diet so not only can you feed it carrots, it also enjoys nice sweet treats like ice creams mmmm. I LOVE to eat! Nom nom nom! From a parent point of view I am impressed with the snacking because they are made from paper so it's minimal mess to clean up, it's more like confetti coming out the other end, and that's exactly what my youngest used this colourful surprise for. She got just as much enjoyment out of the munched up paper as she did with her new friend. The little basket which was initially for carrying the snacks in doubled up as a poop collector. 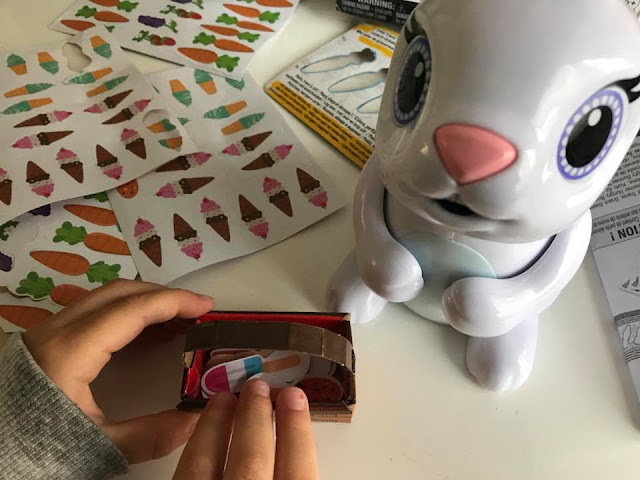 And another positive that makes this toy even better, the rather simple treat tracer means that you can continue to make yummy treats long after the supplied snacks run out. All you need is a sheet of paper to draw on. Adding another element to the game-play. Bring home your own Hungry Bunny for nom, nom, nom fun! Interaction is easy but effective. You can create reactions by either patting their head, tickling the tummy or pressing on the nose. 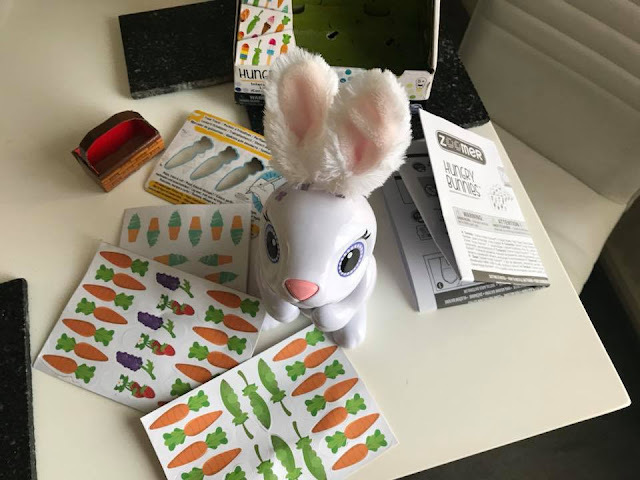 You'll hear laughter, singing, you might even hear a tummy rumble, it will be up to your child to decide what their bunny is in need of. A great way to start teaching them about responsibility. Children will also love watching the ears and arms wiggle as the excitement builds. I think the only negative I can come up with is the fact that it's more plastic than fluff. It would be made even better if the bunny's body was soft and fluffy like the ears and tail but we can't have everything can we. With a recommended price of £29.99, these adorable bunnies with their floppy ears and fluffy tails are ready and waiting to be bought home. They get a big thumbs up from my kids. Great value for money with the amount of activities you can do with them and of course play doesn't have to end there. Our bunny as become the next family member, getting a place on the youngest's bed when she goes to sleep. Just like a real pet but with less of the mess.